A team from FORMUN went to Faisalabad on the official invite from the FAST FSD debating coach Haidar Mairaj. Muhammad Omer Imran, Ahsan Ali, Affaf Shaikh and Usama Nasim were the people who represented FCC. The agenda of the session was to introduce the students of FAST to MUN, who were new to it. It was an interactive session which included a discussion and Q & A session so that the learning was increased and every aspect of MUNing was covered. Ahsan Ali gave an over view of the technicalities and rules of procedure. M Omer Imran introduced the MUN society there and officially invited them to FORMUN. Affaf Shaikh and Usama Nasim presented on the technicalities of MUN conference and MUNing rules. The audience was also briefed on the history of FCC and FORMUN’13 where various events were conducted by FORMUN, and the society’s achievements at different MUN conferences. 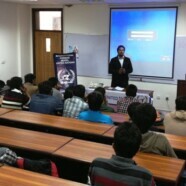 People who attended this session were delighted to know about FCC and FORMUN. Many students showed interest in attending FORMUN’14. It was a successful visit. The turnout from the students of FAST was very impressive. MUN society of FCC is thankful to their hosts for their hospitality.